A recent NHLRC summer workshop trained teachers how to teach language classes that combine foreign language learners with heritage speakers; the latter grow up exposed to a language at home while being educated in English. UCLA International Institute, August 4, 2016 — In June 2016, 35 language teachers attended a five-day summer workshop conducted by the National Heritage Language Resource Center (NHLRC) on teaching languages to “heritage speakers.” A heritage speaker is someone exposed to a language other than English at home – the heritage language — but educated in English at school. Over 57 million people in the U.S. speak another language at home, and this number includes heritage speakers. These speakers have abundant potential for expanding the nation’s language expertise if they are taught their language properly. But they haven’t acquired complete proficiency — they may not be able to read or write, for example, or may speak a nonstandard dialect. Nonetheless, their comprehension and speaking skills are too advanced for classes designed for foreign language learners, and many teachers do not know how to help them. While it’s best to teach heritage speakers and foreign language learners separately, most schools can’t do this, and the workshop addressed the principles of heritage language pedagogy as well as how to teach mixed classes. One way to teach heritage speakers and mixed groups is through project-based learning, in which an instructor devises long-term projects for students to carry out in the target language, collaborating in small groups. 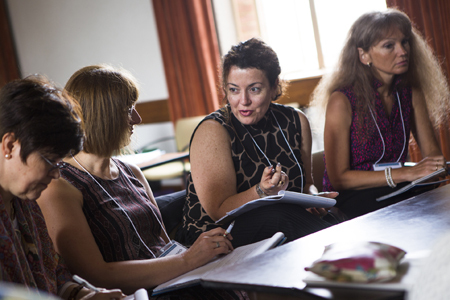 NHLRC and workshop co-directors Olga Kagan (UCLA) and Maria Carreira (California State University, Long Beach) detailed the steps needed to design pedagogically sound projects. Along with Alegría Ribadeneira (Colorado State University-Pueblo), they discussed student projects that they have used in their classes, including creating English subtitles for foreign-language documentary films, compiling folk remedies from the target culture, and researching and presenting on STEM career opportunities for college students. Workshop participants then worked in groups by language to create their own projects. As one workshop participant commented, “It is clear to me how project learning can level the playing field in mixed classes.” In a well-designed project, every participant both benefits from the activity and contributes to the learning process. Participants have a real-world issue to investigate and a choice in how to approach it and wind up with a tangible product. Meanwhile, the project framework, involving the purposeful use of the target language, allows a teacher to group students according to language proficiency and offer mini-lessons as needed. The National Heritage Language Resource Center, based at the UCLA Center for World Languages, is one of 16 Language Resource Centers funded by the U.S. Department of Education and the only one devoted entirely to heritage-language research and pedagogy. The teacher workshop was cosponsored by the Asia Institute, Latin American Institute and Center for Near Eastern Studies of UCLA International Institute. The workshops are funded by STARTALK, a component of the National Security Language Initiative, which seeks to expand the teaching of strategically important languages that are seldom taught in the United States, among them, Arabic, Chinese, Hindi, Korean, Persian, Brazilian Portuguese, Russian, Swahili, Turkish and Urdu. Teachers selected for this summer’s workshop were instructors of eight of the STARTALK languages, plus Spanish. They teach at K–12 schools, colleges, universities and community language schools located from Southern California to the East Coast.